It seems that for every week that passes by, I tell myself I should write and work on updating this blog. Of course, I blink and whoops, it’s been almost 2 years since my last post. I do mean to make more of an effort, and being busy doesn’t feel like a proper excuse. The biggest and more important news in my life is that I am now *Mrs. Elyse Leckey* (patent pending). On a beautiful and crazy hot day last September, I got dressed up as a fairy bride and married my best friend. We had a gorgeous medieval fairy tale celebration, and all our guests joined in for the fun. I worked very hard on putting together such a magical day with my handsome prince charming. And, as you have probably guessed, hand-making jewelry for myself and my bridal party was high on my list of things to accomplish. My engagement ring, perfectly chosen by Mr. Husband, featured a beautiful rainbow moonstone, one of my favorite pebbles on the planet. Following this trend, I used countless moonstone cabochons in my subsequent creations. Firstly, I designed and created necklaces for my bridesmaids and flower girl in the shape of little will-o-wisps. I made Russian leaves, using the technique employed by Simple Beading Patterns (credit where it is due!! ), and left them amply open to give the bit of magic in my stones the ability to fly! I was very happy with the final results, not to mention very proud, because I had never made so many pieces of the same design at once. I usually create one of a kind pieces that take a spirit of their own, but these little fairies were like a little family! I learned a great deal about creating designs that can be easily replicated. I should also admit that I am still not completely happy with how the pendants ended up sitting (and sometimes twisting and flipping) once completed. For this reason, I’ll need to do a bit more experimenting with the weight of the fairies and the mobility of the wings before I start selling this design in my etsy shop. I also made my own bridal jewelry set! I went particularly ALL OUT in designing my headpiece, which unlike the previous fairy necklaces, was perfectly balancing the weight of the stones and sat pretty on my head without a problem. And that was it! About 15 months of beading (along side wedding planning, crafting decor and another million), all for one fantastic day that I will never forget. Most of the wedding photos above were taken by the talented Shea-Lyn. Before/during/after the wedding grew an ever growing obsession for pointed crystals. I seriously can’t get enough of these! I created six pendant necklaces, testing out different colours and focal centres, which were sometimes cabochons and other times large beads that I felt were fitting to an overall atmosphere or feeling each necklace was conveying. The best part about showing these necklaces off was being able to do it with lovely models! Above are featured the necklines of my friends Caro, Kim and Anik. This shoot was more than a year ago, but I am still so grateful for their help and can’t wait to do this again! Next time, I definitely want to do something with fantasy costumes and accessories to fit the theme of my work a bit better… So many ideas! I got to work with my darling sister, and up and coming photographer just blooming with talent. Check out her work and think of her next time you’d like portraits or product photos in Ottawa! My FAVORITE in the series above has to be my Muggle Patronus pendant. Not all of us can cast a Patronus to protect ourselves, so I have here a bit of the White Stag’s inner spirit, to ward off soul-sucking creatures. Regarding the design of the necklaces…I was really going in the right direction as far as pendants and using atmospheres and matching focal points, but there were a few issues. Mainly, the rope-work was simply too time consuming, even if I loved how dainty and lightweight the chains turned out. The chevron idea for grasping the crystal points was cute, but it didn’t always work out with the random shapes every piece has…and I do love the natural aspect of each crystal! The final labour and materials prices ended up really cranking the price to my potential customers, which I ultimately disliked. I couldn’t get these pesky little beauties out of my mind, however! I spent days on end matching little crystal points with focal beads and cabochons…and one more element: CHARMS! The design options, still speaking of atmospheres for each piece, are endless! As my ideas evolved, I decided to follow my hands in the way a hobbit would follow her feet, and chose freeform peyote as my approach of choice. This means that I can incorporate little specks of magic as each pendant takes form! To save time, and costs for my clients, I chose to use suede or ribbon necklace chains instead of beading them myself. Did I mention? I love love love special requests! Here are my first three in this new wave of design, with so many more on the way! See how there’s an overall similar look for all of them, but how different each turns out depending on colours, charms, and shapes? In any case, Dragon Magic should NOT be trifled with! In creating my bridal tiara, I came to realize that headpieces are truly my favorite to make. I have searched far and wide across the plains and oceans of the internet, and it has become obvious that handmade beadwoven hairbands and tiaras are very rare. I choose to solemnly rise to this occasion and offer ladies and gentlemen gorgeous, lightweight and completely customizable headpieces. All girls are princesses, all boys are princes, and I shall crown them all! And it’s just when things are finally quieting down and that I think I have plenty of time to work on new projects when life comes KNOCKING! I was invited to take part of the NCR Uncovered Art Show/Gala last March 29th. As one of only a few artists being featured with jewelry, the experience was simply incredible! I sold 13 PIECES, which I couldn’t have predicted. I was able to meet and talk to many customers, and learn more about my target audiences. Something that hadn’t occurred to me before, is that children and preteens seemed to adore my work! I vowed to make kid allowance-friendly pieces for next time. My favorite customer was a young girl who came by my table with (I think) her grandmother, on 3 different occasions. I was so flattered by her return visits, this sweetheart made my night. She chose in the end the opaline crystal pendant pictured above, with the golden lotus charm and Lucite stone. I hope it brings you joy and wonderment, little one! A little piece of my heart left that art show with you <3. I got to introduce Ziroonderel at this show, my new witch assistant. Her frame came to me secondhand, and I didn’t want to let her go despite her cracks and bumps. Never fear, witchy friend, I can see your inner magic, and thou art beautiful! I did the decoupage myself with letters Mr. Husband printed off for me. He’s been working on transcribing the contents for his university professor, and the script is from 1789. I was immediately drawn by the skillful handwriting of the period, and I just knew Ziroon would like her new skin. The power of words, that is true spellwork! I also got to bring my new displays to the show! Created by request by Drifting Concepts, I call this bust the Neck of Hera. It goes so nicely with my Mysterious Island necklace. I also used this branch display, which is perfect for bracelets and earrings. I made a bunch of other small things in the last 20 months. I also got great photos of my work and got to put up breathtaking etsy listings. We all know how life catches up and makes it difficult to maintain our various habits. I do adore this blog and hope to return more often. Big things have been happening! Firstly, I am not Captain of the International Beadweavers! I am incredibly proud of having inherited the former “Etsy Beadweavers”, my goal is to help the team grow by opening up membership and explorations to other web-shop mediums, including using other hosts and social media. Check out the brand new website for the team! I also won my first ever beading contest, the Jules Verne challenge hosted by my favorite beading team, the International Beadweavers! Otherwise, here are a couple things I have completed in the last little while! I participated for the first time in a swap between group members- the organization was smoothly done! If you’ve never done a swap, think Secret Santa for crafters (who sell online and have no time to make extra gifts during the holiday season!) I answered a survey telling my future partner my likes and dislikes, the stitches I am comfortable with and those that I am not, and was sent the survey results of another team member. The identity of my ‘swapee’ had to remain a secret as to not spoil the surprise, so though this piece was completed about a month ago, I couldn’t reveal it online until the swap project was completed. This piece is definitely one of my best yet. My partner pointed out that she like a-symmetrical design, so I played around with different stitches in circular patterns in her favorite colours. I really hope to create more in this vein later on, the possibilities are endless! Of course, you can request your very own necklace by visiting my Etsy shop! Don’t hesitate to contact me, let’s discuss how you can wear your own imagination! Check out all of the 23 creations here! I am incredibly proud of this piece, inspired by the beauty, volcanic devastation, and re-discovery of the ancient city of Pompeii. This piece was entered in a challenge! Vote for your favorite Pompeii inspired piece here until April 15th! Inspired by the Antique styles of coastal cities like Pompeii, before the devastating volcano eruption, this statement necklace made to look luxurious, mysterious and natural. The Ethiopean Fire Opal at the core of the necklace reacts beautifully in sunlight, shimmering a thousand colours that can unfortunately not be captured with a camera. 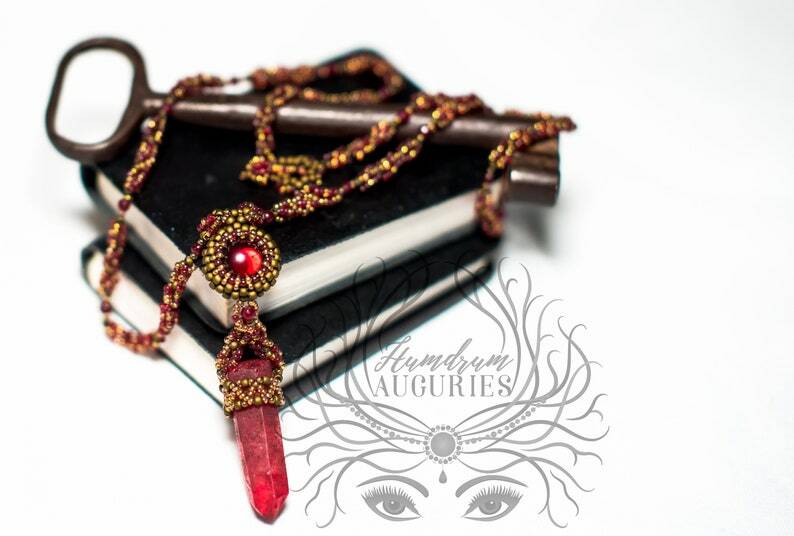 Garlands of gorgeous garnet stone and quartz dance around natural volcanic rock beads. The pendant is an Eye of Shiva, symbolizing the healing power of the sea in contrast to the fiery lava flow. Check it out on etsy! The eruption of Mt. Vesuvius in AD 79 was a tragic event, yet the eventual historical implications were for the most part positive. The very word ‘volcano’ was invented as a reaction to the event; nature had never before displayed it’s power in this manner to the human eye. The particular volcanic situation of Pompeii allowed archeologists to study a very well preserved site, thanks to the composition of the volcanic debris, teaching us untold stories about this period of antiquity. Items such as jewelry made of precious and semi-precious stones, pearls and seashells were found in very intact states, telling us of the styles adored at the time. Introducing an official and continuous Humdrum Auguries design! The Little Augury bracelet is the perfect union between charm and beaded bracelets. These glorious little gems are just begging to be customized! I am very excited to take on personalized creations! . I have currently three Little Auguries for sale made with Swarovski Crystals, and three made with gemstones. Each Little Augury is destined for a wearer. The little charm will call out to it’s future owner, the colours and metals will glimmer to their eye. After wearing it for a few days, the bracelet begins absorbing the energy of the wearer, accumulating meaning and power. The crystal auguries add a bit of sparkle to any outfit and emphasize the interests and goals of the wearer. Check them out here! The gemstone auguries possess the most power, influencing the mood and luck of their owners based on both the charm symbol and the properties of the gemstone. Check them out here! Want to wear your own imagination? Don’t hesitate to message me. New writer on the EtsyBeadWeavers Blog! I am a writer by nature, and beader by choice. Writing has always been by ultimate hobby, method of expression and ambition. Being accepted as the new moderator and writer for the EtsyBeadWeavers blog is the start of a new adventure. Each month I hope to release at least one article relevant to handmade artists and beading, along with interviews and features of beadweaver’s gorgeous shops. I welcome all forms of comments, feedback and ideas for future articles. Don’t be shy to tell me about your experiences, your stories and lessons, what you’d like to hear about or learn about…Anything! I love using the work and minds of other artists as inspiration. You can follow the EtsyBeadWeavers on facebook! An anecdotal encouragement piece to be proud of your unique creations. A brainstorming guide to staying active and inspired during the darker months. This Humdrum Auguries original design is the first result of endless possibilities. As a beadweaver, I not only love seed bead stitching but I also adore collecting charms. These little pendants are important symbols charged with the wearer’s energies and goals. This piece in particular is intended for Fertility and Prosperity. Ideal for someone starting a new project, a new phase in life, or specifically, for women trying to conceive. Want a charm necklace of your own? Let me know what symbols speak to you! Click Here to Visit my Shop! Check out what is inspiring me!